The walk starts and finishes in Buckland Monachorum, the village at the centre of this very scenic and historically interesting parish. It descends the valley of the River Walkham, flowing off high Dartmoor, follows the river until it reaches the Tavy past a variety of old mining sites and then climbs back to the village. The walk crosses and re-crosses the West Devon Way, one of Devon’s long-distance walks which links Okehampton with Plymouth and which also passes through Drake’s Dartmoor. Buckland Monachorum lies just outside the boundary of Dartmoor National Park, between Tavistock and Plymouth and is reached by relatively narrow roads. It is served by regular buses to and from Yelverton, which is on the main road between Tavistock and Plymouth and which has regular bus links to and from both towns as well as to Exeter at weekends and on weekdays through the summer. Buckland Monachorum : buses and a pub; there are some small car parking areas along the route but no other facilities. There are no stiles but three climbs - one gentle climb of 50m/165 feet; a shorter one of 20m/65 feet; and a longer one of 100m/330 feet. Sir Francis Drake has many associations with the parish of Buckland Monachorum, in the far south west corner of Dartmoor. 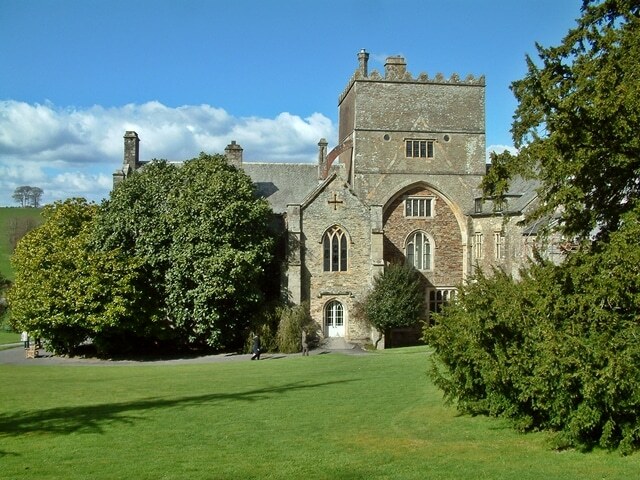 Chief among these is the fact that he made Buckland Abbey his home, but he also had links with the village itself. The Drake connections have prompted the promotion of the area and its history, facilities and walks as Drake’s Dartmoor. The walk starts outside Buckland Monachorum church. However, the bus stop for the village is at the far end. If arriving by bus it is worth returning into the village for a look around. Buckland Monachorum has a number of fascinating old buildings, making it very picturesque as well as interesting. Towards the top of the village is the Gift House. This is reputed to be an almshouse dating to 1661 and endowed by a Sir Francis Drake, a descendent of the famous one. He left £120 to build an almshouse for six “pious” persons born and bred in the parish. Further down are a number of houses of similar age or even older, especially nos. 15, 16 and 17. The pub, the Drake Manor Inn, is also from the 1600s and may have been the former church house. The church is also a fine example of ecclesiastical building with a good interior. The present church was built around 1490 on the site of an earlier one, and has always had close links with Buckland Abbey, a mile or so to the south. The Abbey was founded as a Cistercian monastery by the Countess of Devon 1275 – hence the village and parish name “Monachorum”, Latin for “of the Monks”. Following the dissolution of the monasteries, it was sold in 1541 to Sir Richard Grenville and then, in 1581, sold on to Sir Francis Drake. It is now the property of the National Trust and is well worth a visit. It is not on this walk. Notice the stone plaque above the door, commemorating its building in 1702 and repair in 1850. The hall is in fact the old school for the parish. Netherton House, which was a farmhouse dating from the 1600s, is not visible from the road, but on the right here is Whitehall, formerly Netherton Cottage, which dates back to the same time. Roborough Down, is the very western edge of Dartmoor. It was an area of Iron Age occupation and seems to have been farmed until medieval times. The walk cross the West Devon Way. Note the waymark signs by the gate. 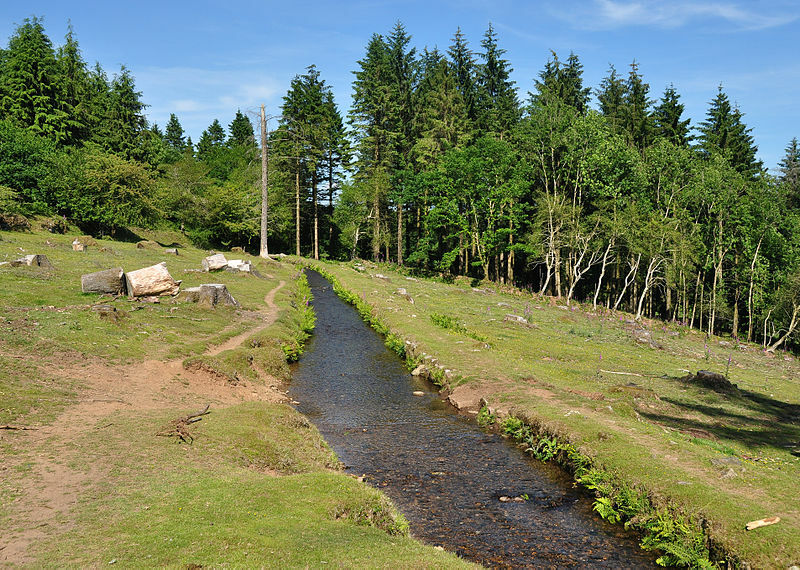 The West Devon Way is a 36 mile route between Okehampton and Plymouth, largely following the western edge of Dartmoor. Following it to the right here will lead to Yelverton and then, ultimately, Plymouth while going left leads to Tavistock and on to Okehampton. We will enter an old mining country and near the bottom of the slope, by the steep zig zags in the path, is the site of the old 19th century Walkham United Mine, where copper was extracted. Many of the slopes here are artificial, being the remains of spoil heaps, although the area all looks very picturesque now. The river Walkham follows under Grenofen Bridge. The Walkham rises high on Dartmoor before eventually joining the larger River Tavy. Our walk now follows the Walkham to its confluence with the Tavy at Double Waters. The remains of another copper mine are passed, this time with an intact chimney. This was Westdown Mine, another 19th century venture. It is hard to imagine the noise and fumes that must have been here 150 years ago. Double Waters is where the Walkham joins the Tavy. In due course the Tavy, reinforced by the Walkham, will itself meet and be absorbed by the Tamar. There is yet another old copper mine. This is older than those passed previously, being in operation from 1558 until the 1870s. It goes by the wonderful name of Virtuous Lady Mine, said to be named after Queen Elizabeth I. 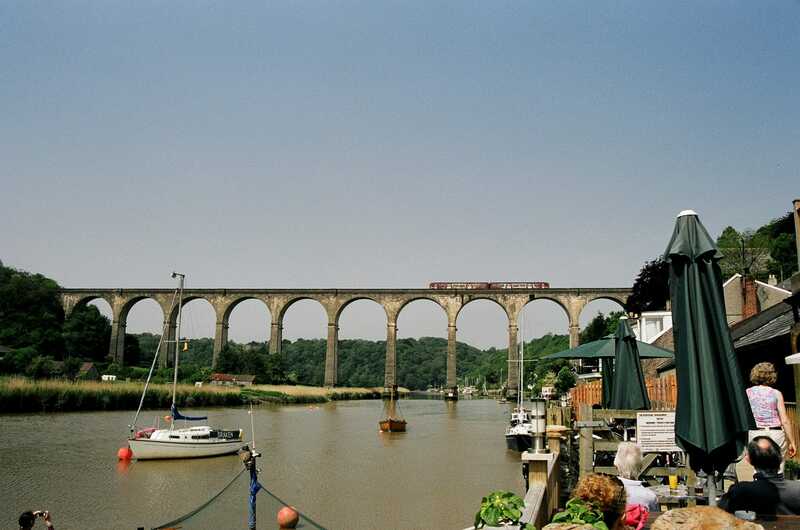 There are superb views over the Walkham Valley and also backwards towards the Tamar Valley.